This ebook is viewable via the VitalSource Bookshelf platform, available for download here. 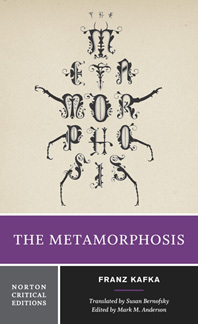 Franz Kafka's 1915 novella of nightmarish transformation became a worldwide classic and remains a century later one of the most widely read works of fiction in the world. This new and acclaimed translation is accompanied by possible inspirations and critical analysis of Gregor Samsa's strange story. · Susan Bernofsky’s acclaimed new translation, along with her Translator’s Note. · Introductory materials and explanatory footnotes by Mark M. Anderson. · Related texts by Kafka, Leopold von Sacher-Masoch, Friedrich Nietzsche, and Rainer Maria Rilke, among others. · Eight critical essays by Günther Anders, Walter H. Sokel, Nina Pelikan Straus, Mark M. Anderson, Elizabeth Boa, Carolin Duttlinger, Kári Driscoll, and Dan Miron.